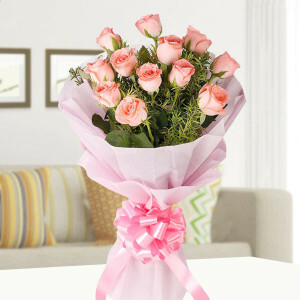 Send your love to Hyderabad by sending flowers online with MyFlowerApp to the City of Pearls. Choose from numerous exquisite floral arrangements, and multi-hued flowers including roses, gerberas, carnations, orchids, and so many more. 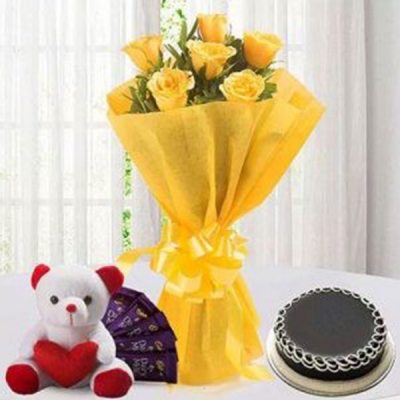 Send these flowers or a combo with cakes, chocolates, and gifts, anywhere in the City of Biryani, and we will deliver quickly, free of shipping charges. 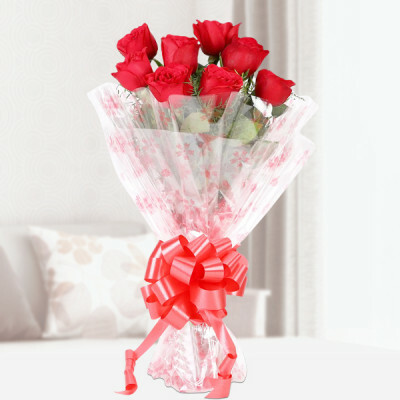 If you are still looking for the perfect gift to send to your dear ones in the City of Pearls, order their favorite flowers online. 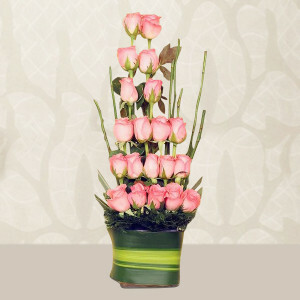 These vibrant blossoms speak a special language without words that can articulate your emotions perfectly for you. 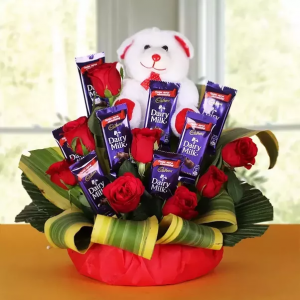 Be it a birthday, anniversary, Mother’s Day, Valentine's Day, Father’s Day, Raksha Bandhan, Holi, Diwali, or any other occasion, the best gifting idea for all events will always be flowers. 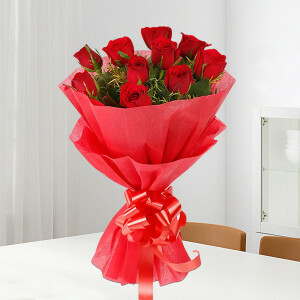 Send flowers online to Hyderabad with MyFlowerApp, and wish your dearly loved ones on their special day. 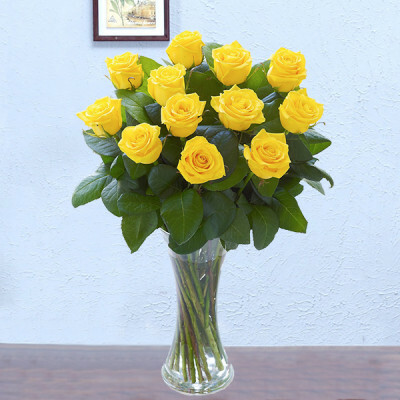 Whether you are trying to say Sorry, Thank you, Get Well Soon, Congratulations, or sending lovely bouquets just because you felt like it, you can find the best flowers for every occasion available here. 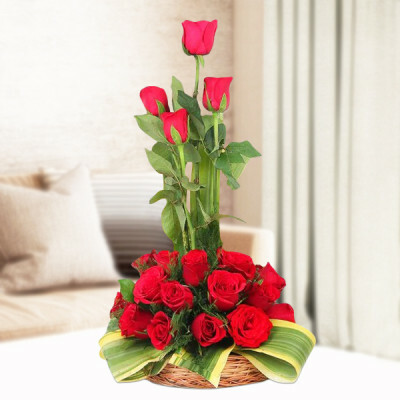 Order their favorite flowers set in vases, bouquets, and baskets, or get them set in gorgeous designs that will express your emotions perfectly. 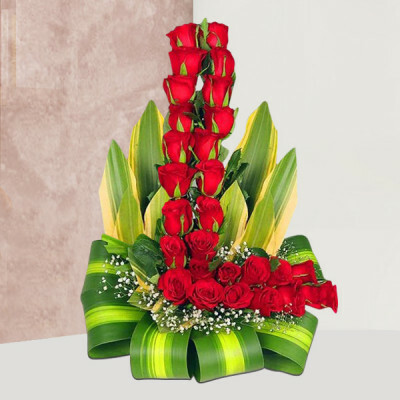 Get vibrant fresh roses, gerberas, carnations, lilies, orchids, tulips, birds of paradise, and other exotic flowers or go for mixed flowers and floral arrangements. From Heart in Heart Red Flower Bouquet to Double Rose Heart, Red Roses Tall Arrangement, Entire Roses from Garden, Number Flower Arrangement, Alphabet Flower Arrangement Personalized, Carnation and Lilies Arrangement, Mix Gerbera Arrangement, and so many more – order your preferred designs and our expert florists and artisans will deliver exactly what you want. So this year, be a part of all festivities with the special people in your life, even if you are not physically present, with MyFlowerApp’s online flower delivery to Hyderabad. 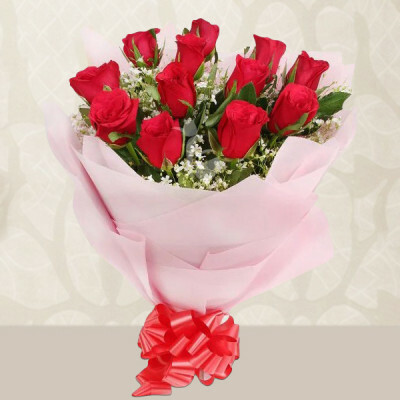 Overcome the hurdles our hectic lifestyle puts across our relations this year, with MyFlowerApp’s online flower delivery to Hyderabad. 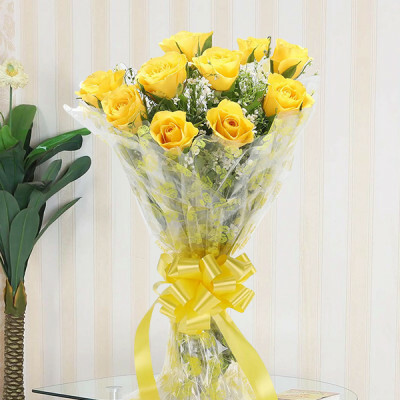 Be a part of the celebration despite the distance between you and your dearly loved ones, by being in their thoughts through dazzling flowers sent online directly to their doorsteps. Place your order for anywhere in the City of Nizams and we will deliver for you anytime you want. Our customers and their emotions matter to us, and we work hard in ensuring that your affections reach their destination on time. 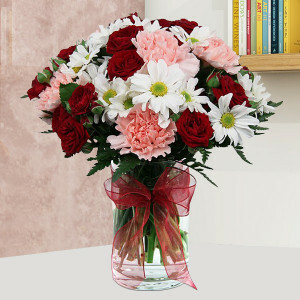 Your order will contain only fresh flowers and classy flower arrangements set artistically. With multi-hued blooms delivered directly to your doorsteps professionally, you will receive the best services throughout the HITECH City. 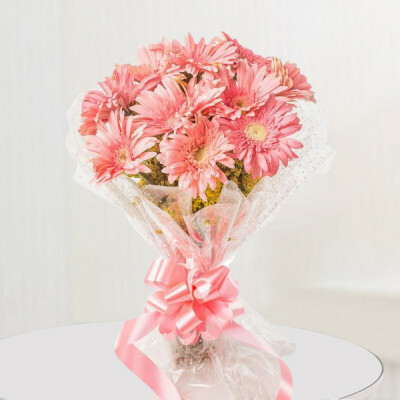 With the wisdom of trusted local florists behind us and the best flower shops in Telangana serving you, you can rest assured that everything you receive will be in pristine condition. Select your favorite flowers and arrangements from our extensive range and get delivery within 3 hours anywhere in Hyderabad. 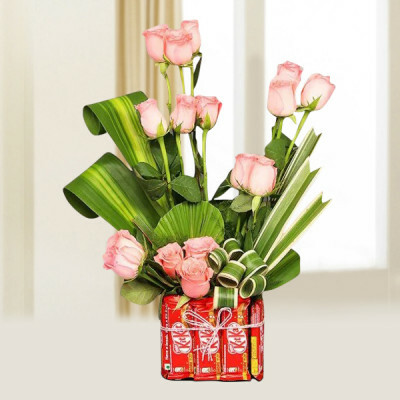 You can now send your love, anywhere in the city without burning a hole in your pocket with our magnificent flower arrangements for all budgets and free shipping throughout. Get gorgeous handpicked flowers delivered at your doorstep anytime with our Midnight, same-day, and express delivery service options. With our adept, expert florists and artisans working on your beautiful flowers, we guarantee you quality assurance. 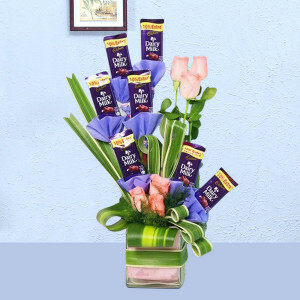 Along with the flowers, you can also send cakes, chocolates, personalized gifts, and more as add-ons or order from our expansive selection of economic combos for every occasion. 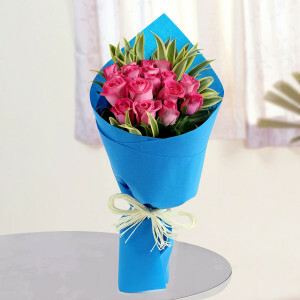 Send flowers to Hyderabad with MyFlowerApp.com, and leave everything else on us. Complete your order with easy and secure payment options and we will deliver your gifts to your home on time and in immaculate condition. Are you sad because you missed planning the perfect gift for your dear one? Worry not, because MyFlowerApp has the solution for you. Often dates slip our minds due to our hectic lifestyles or we do not get the time to buy the gift. The solution to all your issues is here. Place your order for the exact present you wish to send to your dearly beloved and we will deliver them for you anywhere in the World Capital of Biryani. You can send your affection wrapped with the soft petals of dazzling flowers today by opting for same day delivery or send them anywhere in Hyderabad within 3 hours by going for express delivery. You can also plan the perfect surprise for your darling midnight delivery and send their favorite flowers as the clock chimes twelve. Or brighten up their entire day with early morning flower delivery to Hyderabad and be their first thought on their special day. Select gorgeous flowers that they will love or order floral arrangements that express your emotions perfectly for your mother, father, wife, husband, girlfriend, boyfriend, sister, brother, in-laws, friends, or any other dearly beloved. 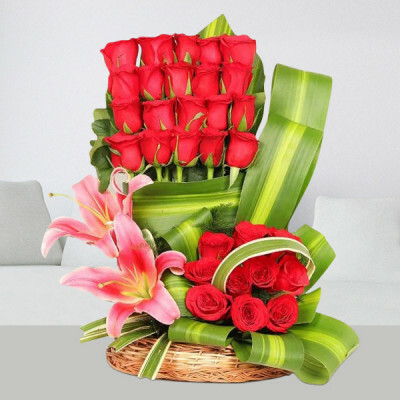 Get online Flower delivery in Hyderabad anytime you prefer, with elegant products like Basket of Pink Lily, Graceful Red Roses Bouquet, Orchids and Mix Roses Arrangement, Pink Roses Heart, Basket of Sweet Emotion, Red Gerbera Vase, and more. Valentine’s Day is one of the most awaited days for couples. If you have been waiting to celebrate this occasion with your beloved as well, but the distance between you both is hampering your plans, MyFlowerApp is here to save the day for you. Articulate your emotions for your soul mate and send your love through online flower delivery in Hyderabad on the most romantic day of the year. This 14 February, let the flowers do the talking for you. 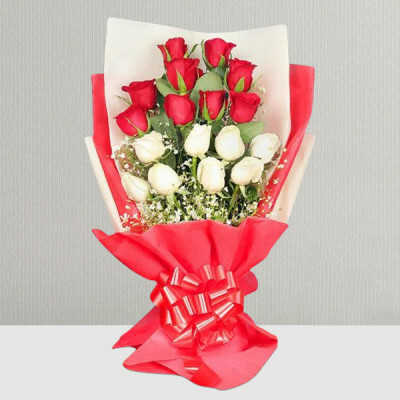 Order elegant red roses, their favorite flowers, or heart-shaped floral arrangements, and get them delivered directly to your darling’s doorsteps. 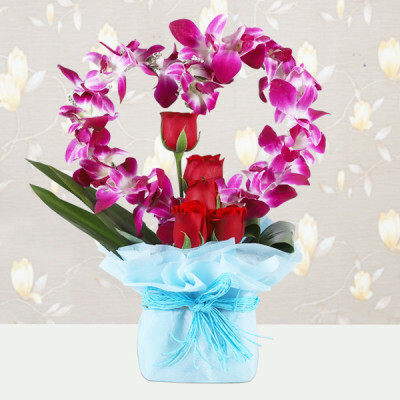 Place an order for vibrant flowers and other gifts that express your emotions perfectly and let us be your Cupid, as we deliver your affection to your sweetheart. 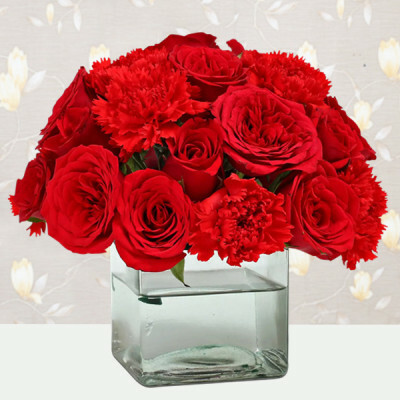 From multihued roses to romantic lilies orchids, carnations, gerberas, bird of paradise, and many other exotic flowers, get professional delivery of fresh blooms for your partner anywhere in Hyderabad. Along with these beauties, you can also express your affection through cakes, chocolates, soft toys, personalized gifts and more. 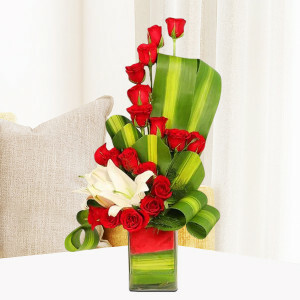 These are all available online at MyFlowerApp.com, in combos and as add-ons that you can include with the flowers, or buy separately. Get chocolate cake, butterscotch cake, strawberry cake, Ferrero Rocher, personalized cushion, mugs, photo frames, key chains, etc. and express your love for the love of your life. 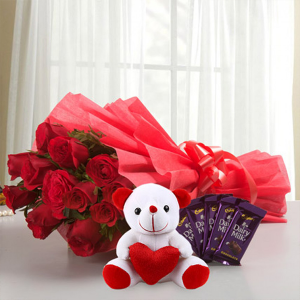 You can get a gift for your love, that is entirely theirs by ordering from our personalized gifts range and getting your memorable moments or something significant oriented on them along with some romantic text. Or get them something they enjoy like green plants for the one with a green thumb or Valentine Serenades for every day of Valentine Week. Place your order for a Desert Rose or the Lucky Bamboo, or send combos and gifts for 2, 3, 4, 5, 6, 7, days of Valentine. 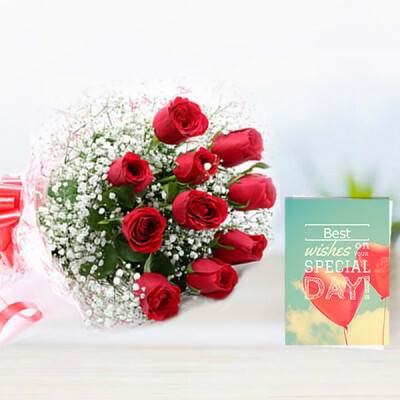 Whether you wish to express your love for your wife, girlfriend, boyfriend, or husband on Valentine’s Day or are celebrating any special event with your family and friends, MyFlowerApp will come through for you. Express your heartfelt emotions of love, affection, care, gratitude, and respect anywhere you want including Indian cities like Delhi, Noida, Faridabad, Mumbai, Chennai, Kolkata, Bangalore, Hyderabad, Pune, etc. and overseas as well. 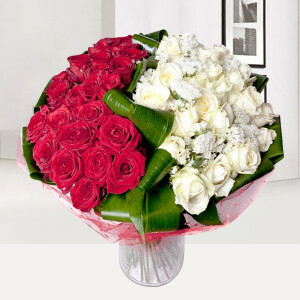 What Is The Process For Placing An Order For Flower Delivery To Hyderabad? The process of placing an order with us is actually quite simple. Peruse through our extensive selection of gorgeous flowers at our website MyFlowerApp.com, move to the link ‘Hyderabad’ under ‘Flowers’, in the menu ‘Cities’. Select your favorite flowers or floral arrangements from the numerous options available. Click on the product, and then Click on the ‘Buy Now’ button below it. Add other products from the add-ons menu that appears and select ‘Continue’, or click on ‘No thanks’. Once you are done shopping, click on ‘Proceed to Checkout’, and enter all the necessary information that is required. Complete your payment with our easy and secure payment options, and we will process your order, and send it with much love, straight to your dear ones. Can I Get A Combo Of Cake Along With The Flowers? 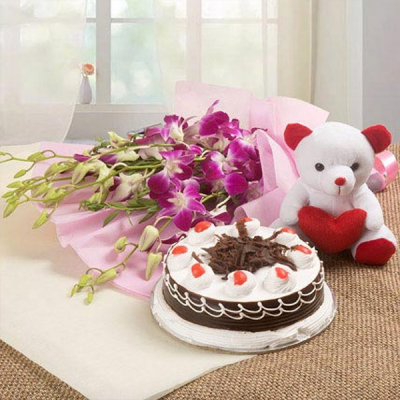 We have the options of numerous Flowers n Cakes combos for you to select from. Alternatively, you can also place an order for one of our floral arrangements and include any cake of your choice from the add-ons menu, and we will deliver them together, wherever and whenever you want. Is Flower Delivery In Hyderabad Possible Today? Yes! 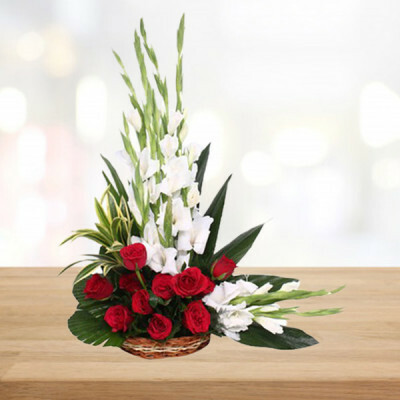 By opting for our same-day delivery option after selecting your preferred bouquet, vase, basket, or arrangement, you can get same-day flower delivery in Hyderabad. If you are in a hurry, we also have the option of express delivery with which we will reach your destination within 3 hours. 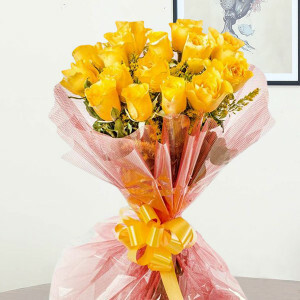 Can I Send Flowers to Hyderabad At Midnight? Yes. We have the option of midnight delivery for the Hyderabad area. As long as you place your order by 8 p.m., we can be at your destination with gorgeous, fresh flowers, anytime between 23.30 to 00.00 hours. 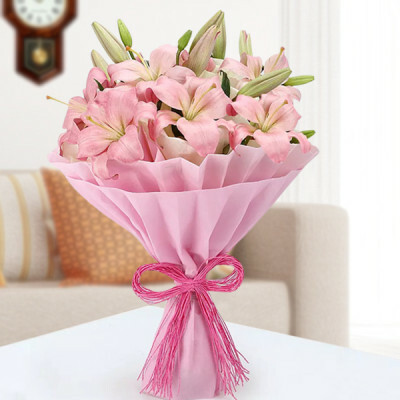 How Can I Opt For Fixed Time Flower Delivery? What Is It? 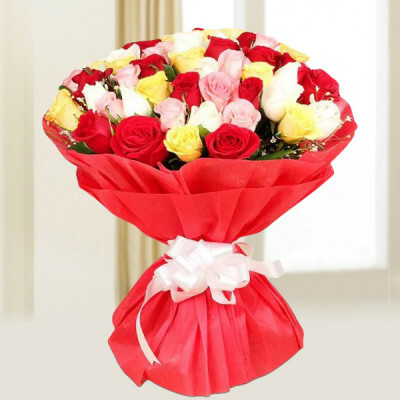 Fixed Time Flower Delivery is an option that we provide to our customers in Hyderabad who need to send flowers at a specific time. Once you have placed your order, you can then select from the numerous time slots available and we will deliver fresh blooms at the time you select. 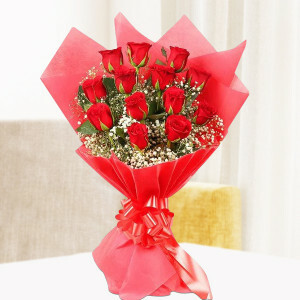 Can I Send Flowers Very Early In The Morning, In Hyderabad? Yes! For the ones planning a surprise bright and early, MyFlowerApp has the option of early morning flower delivery for Hyderabad. After placing your order for your preferred flowers, opt for this option during checkout and we will deliver them anywhere in the city between 8 AM to 11 AM. Do You Charge Some Extra Amount For Midnight, Same-Day, Or Fixed Time Flower Delivery In Hyderabad? 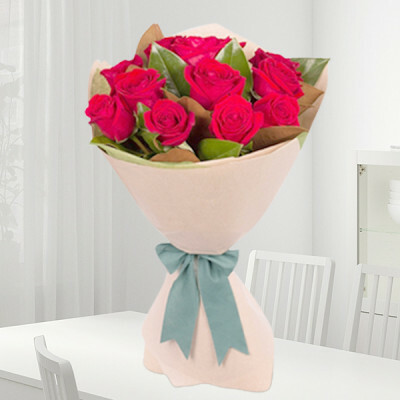 There are some token extra charges for quick flower delivery for specific times. The amount will be included with your order value during checkout. 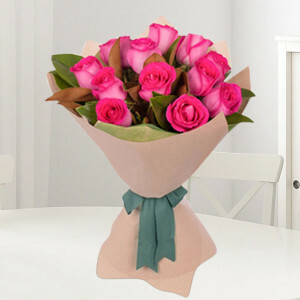 Do You Have A Standard Flower Delivery Option for Those Who Don’t Want To Pay Extra? MyFlowerApp caters to the needs of all customers. 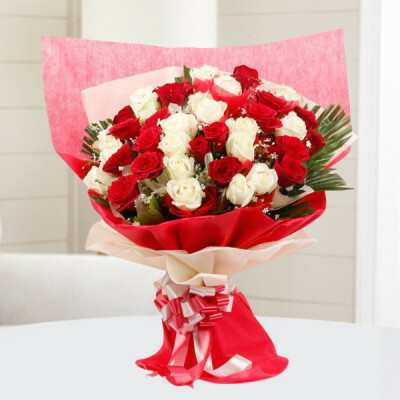 If you want to send flowers to your dear ones in Hyderabad without burning a hole in your pocket, you can go for our Standard Time Flower Delivery option. During checkout, a calendar will pop up from which you can choose a date you are comfortable with, and then select a time slot from the list that appears next. Will My Order Contain Fresh Flowers? Yes, all our deliveries feature only garden fresh flowers, handpicked by professionals. Regardless of what you order - bouquets, bunches, baskets, vases, or arrangements of any flowers, they will all include only fresh blossoms. 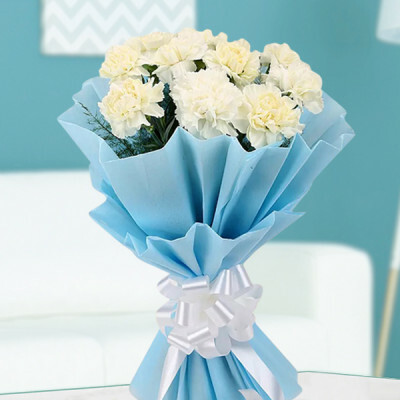 However, to preserve this freshness, you will need to care for the flowers as well. 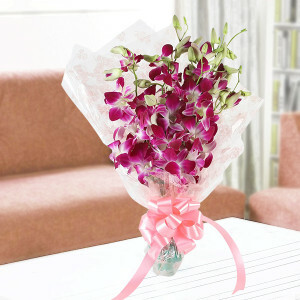 Put your bunch in fresh water, and cut flowers at 1 to 2 inches of the stems at a 45-degree angle if they start drooping. Spray them daily, use a clean vase, and change the water regularly. Their florists are quite proficient with the bouquets. 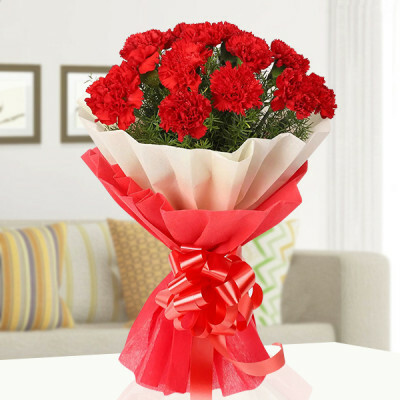 I ordered a Red Mixed Flower Bouquet, and it was delivered to Gachibowli on time and so beautiful with so many different flowers. 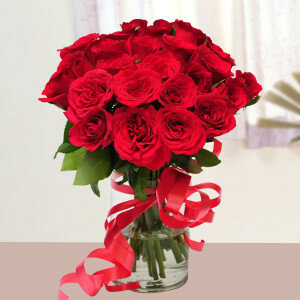 I ordered the 1000 Roses Bouquet and it was perfectly arranged and better than expected. The delivery person took care of it and it was delivered on time. Very professional service. My order for my wife was delivered on time on Valentine’s Day exactly as I wanted. 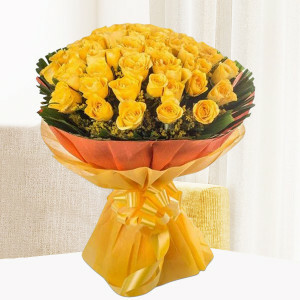 I had ordered a Fascinate Vase Arrangement with a box of Ferrero Rocher and the flowers were arranged so beautifully. Thank you MyFlowerApp. I love this website. 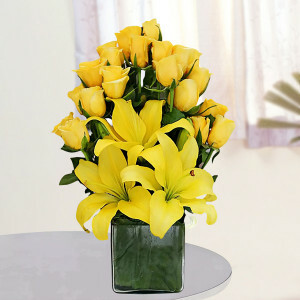 Excellent service, on-time delivery, and beautiful flowers delivered every time. Keep it up MyFlowerApp. Very Beautiful roses. It made a smile on my friends face when she got the beautiful Pink Carnival bouquet. Thank you for your great service. Quick and friendly Customer support team in case of any changes to be made. Also, I would like to convey my THANKS for all your delightful and timely service. I'm extremely delighted. Thanks once again! Cheers! Banjara Hills, Gachibowli, Jublee hills, Ameerpet, Hi-Tech city, Madhapur, Kondapur, Kukatpally, Begumpet, Whitefields, Manikonda, Hakimpet, Toli Chowki, Miyapur, Nizampet, Hafeezpet, Mehdipatnam, Malakpet, Nampally, Saidabad, Amberpet, Humayun Nagar, Mansoorabad, Shanti Nagar, King Kothi, Abids, Lakdikapul, Punjagutta, Himayat Nagar, Kacheguda, Narayanguda, Chikkadpally, Nallakunta, Charminar, Patthargatti, Afzalgunj, Shalibanda, Falaknuma, Dabirpura,Yakutpura, Purani Haveli, Begumpet, Secunderabad, Malkajgiri, Trimulghery, Alwal, Kundanbagh, Kukkatpally, Miyapur, Bharat Nagar, Nanakramguda, Uppal, Kapra, Dilsukhnagar, LB Nagar, Gaddiannaram, Saroornagar, Apollo Hospital, Osmania General Hospital, Medwin Hospital, Owaisi Hospital, Yashoda Hospital, Caremotto, Omega Hospital, University of Hyderabad, Maulana Azad National Urdu University, Osmania University, Dr. B. R. Ambedkar Open University, Osmania Medical College, Gandhi Medical College, International Institute of Information Technology, Institute of Public Enterprise, the Administrative Staff College of India, the Sardar Vallabhbhai Patel National Police Academy, Balaji Temple, Ujjaini Mahankali Temple, Birla Mandir, Puri Jagannath Temple, St Joseph's Cathedral, Badshai Masjid, Charminar Masjid, St. George's Church, Taj Deccan, Taj Falaknuma Palace, Novotel Accor, Marriott Hotel & Convention Centre, Quality Inn Residency, Minerva Grand, Inorbit Mall, Minerva Grand, Manjeera Mall, City Center Mall, MPM Timesquare Mall, Padmavathi Shopping Mall, Ashoka Golden Mall, Hyderabad Deccan Station or Nampally Station, Secunderabad railway station, Hyderabad railway station, Kachiguda railway station, Begumpet railway station, and so many more such locations.